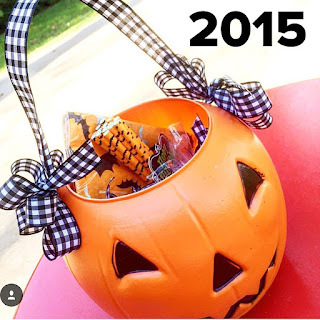 I started making these precious ribbon pumpkins in 2009 and I don't think there has been a Halloween since that I didn't make several. They are so cute, easy to make and also on the budget friendly side of Halloween DIY projects. I make several different options: ribbon filled handle ( feel free to use all kinds of colors and ribbons) or a less busy single ribbon handle. String your ribbon into the existing holes on the side of pumpkin and tie a double knot facing inside the pumpkin ( where you will not see it). After you have a tied on the new ribbon handle tie a eight inch strip of ribbon to each side of pumpkin, down by the hole you just ran the ribbon in. 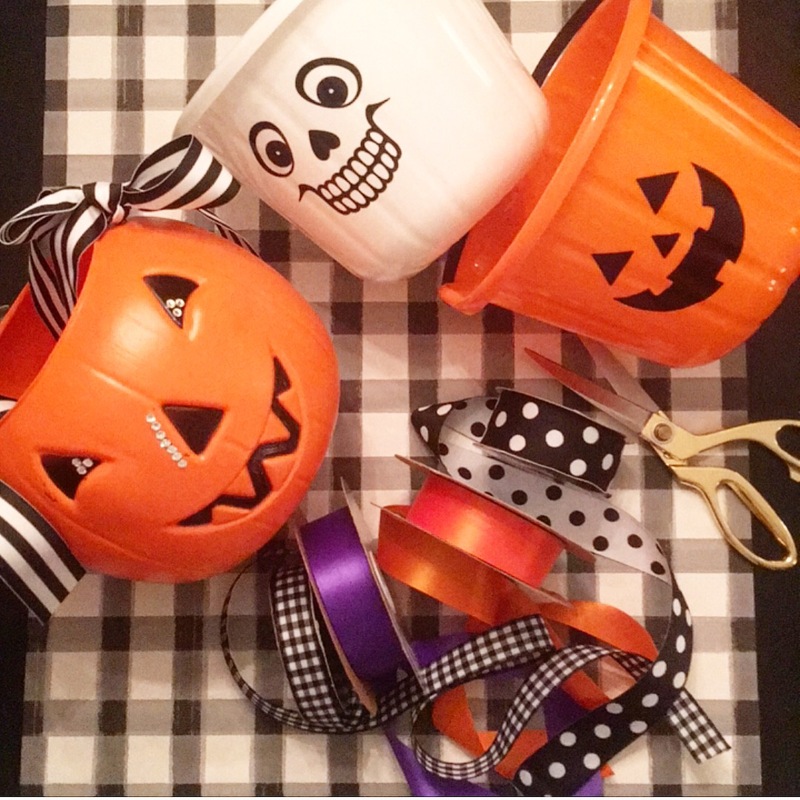 Attach a bow to each side of pumpkin ( or skeleton) using the eight inch strip of ribbon to attached bows to each side. Adding a monogram is EASY and only requires that you order the monogram ahead of time ( or make if you have the capabilities/equipment to do). DO NOT CUT plastic handle off pumpkin!!!!!! You will attach the ribbon to the handle. I use 10 inch strips of ribbon and 8 inch strips of tulle. I have no idea how many yards of ribbon and tulle I use It takes a LOT of ribbon and tulle, the fuller the handle the better it looks. Once you have cut your ribbon and tulle, start by tying a piece of ribbon in a double knot, push it to one end of the handle and keep tying ribbon and tulle ( alternating ribbon colors and sizes as well as tulle) till the handle is full and fluffy! Once you have tied all the ribbon and tulle you want on the handle, using sharp scissors trim the ribbon and tulle a bit to get it to fluffy out and stand up a bit. It doesn't take much, trim were you think it needs. You can use any size ribbon, with or without wire, I think it looks the best to mix sizes, with wire and without, and patterns and colors. This is super easy and takes more time than anything. They make super cute trick or treating pails and cute for stuffing a BOO gift in, hostess gift, the possibilities are endless and who ever the recipient is, they will adore it! 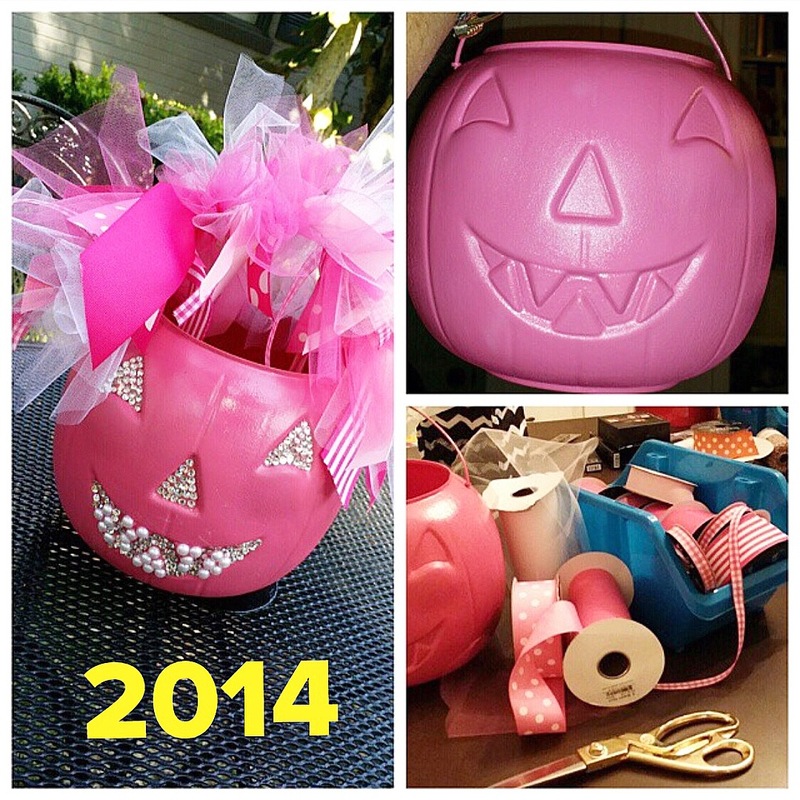 My niece wanted a pink one, so pink pumpkin I made. Then her sister ( my other niece) wanted a purple pumpkin ( done) and a friend wanted blue. I think I have made every color combination you could think of. 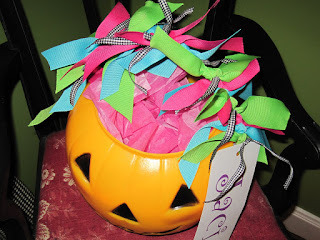 This is my VERY FIRST ever ribbon pumpkin in 2009 ( the blog post is still on here), they pumpkins have come a long way but are still so much fun to make and give away. Tag me in a picture if you make one, I'd love to see.